Zip is an Australian-owned company based in Sydney, exporting Australian-designed and Australian-made instant boiling water systems and other products to more than sixty countries, including the UK, Europe, Middle East and Asia. Used by millions of people worldwide each day, Zip instant boiling water systems save time, energy and money in any kitchen, whilst Zip touch-free washroom products marketed in Australia and New Zealand upgrade office, factory or remote-site washrooms to the hygiene standards demanded today. Zip Hydroboil is the world’s most advanced "on-wall" instant boiling water heater, designed and manufactured in Australia and widely used around the world, not only in restaurant and café kitchens, but also in canteens and industrial staffrooms, and in kitchens in offices, factories, showrooms, schools, universities, clinics, hospitals and public buildings of every kind. The most popular and energy-efficient Zip Hydroboil models store 3l, 5l or 7.5l of boiling water ready for instant use, whilst models with capacities of 15l, 25l and 40l are built to order for catering kitchens, restaurants and food service halls. All can be supplied with stainless steel cases if required, to coordinate with stainless steel food processing and kitchen equipment. Zip HydroTap is the world’s most advanced range of "under-bench" instant boiling water systems, giving not only boiling filtered water for tea, coffee and cooking, but also chilled filtered water at a fraction of the cost of bottled water. A wide range of Zip HydroTap models cater for just about every kind of kitchen, including office kitchens supplying boiling water and chilled water for 100 or more people. The Zip "All-In-One" model gives boiling, chilled, hot and cold water from a single tap, and even turns itself off when the kitchen lights go out. The new Zip HydroTap "Sparkling" gives chilled filtered "sparkling" water in addition to boiling filtered water and "still" chilled filtered water – a world first. Zip is one of Australia’s largest suppliers of water filtration systems for offices, factories and worksites, with an on-site water filter replacement field force of some 400 service technicians and trained service providers covering virtually every region of the Australian continent. Filtered drinking water systems supplied by Zip include simple tap-and-filter systems which can be installed at almost any kind of kitchen sink, chilled filtered systems delivering great-tasting crystal-clear drinking water on sites such as kindergartens and schools, and upright free-standing water chillers widely used to cater for workers’ drinking water entitlements in factories, refineries, mining and civil engineering sites, and major construction sites in remote areas. Today, facilities managers everywhere are more focused than ever before on achieving higher levels of touch-free washroom hygiene. So, as well as exporting Australian-made Zip instant boiling water heaters worldwide, Zip has also brought the world’s top touch-free washroom technology to Australia. Zip touch-free sensor taps are second to none in terms of water conservation and reliability. Zip touch-free flushing devices for urinals and pans have reduced water wastage in washrooms from coast to coast. Zip hand dryers include models for every type of washroom, and HORNE thermostatic mixing valves are simply the best you can choose for safe water temperature control in basins, baths and showers. Wherever you are in the world, our experiences staff can help you select the right Zip products to meet your needs, simply and economically. Zip HydroTap G4. The brilliant new generation of the world's most advanced drinking water appliance has been launched. 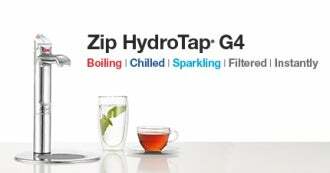 Zip Industries' brilliant new Zip HydroTap G4 is stylish, safe and provides a reliable filtered drinking water supply. Zip supplies Australian-designed and manufactured instant boiling water appliances to more than 70 countries worldwide. Gain greater energy savings with the Zip Hydroboil. The internationally recognised Australian designer, Jamie Durie, has signed on as international ambassador for Zip HydroTap, the Australian-designed, Australian-made under-bench instant boiling, chilled and sparkling water system now marketed in Australia, the UK and 65 other countries.